A team of scientists from Switzerland, Russia, Denmark, Belgium and Canada has for the first time demonstrated that it is possible to track the movement of an electron inside a molecule in real time. Moreover, the scientists claim the electron movements can be manipulated allowing unprecedented control over chemical reactions and biological processes. Using high precision lasers, the international team investigated electron properties inside molecules from an “attophysics” perspective. Attophysics is the study of events that take place the attosecond time resolution. In other words, at the billionth of a billionth of a second. For their experiments, the researchers used molecules of iodoacetylene (HCCI), which consists of elongated chains of four atoms—hydrogen, two carbon atoms, and an iodine atom. A powerful, short pulse laser beam was fired onto the molecules which caused a shift in the electron configuration. Namely, a “hole” (electron vacancy) was formed which oscillated from one end of the molecule to the other, as electrons moved to fill the space, but leaving a vacant slot each time after every jump. This movement was tracked with an unprecedented time resolution of 100 attoseconds. “The study observed the migration of electrons along a linear molecule. We were able to see, for the first time, the movement of electrons, how it all happens, in detail. In addition, we demonstrated that this movement can be controlled, and therefore, it is theoretically possible to control the outcome of chemical reactions,” said Oleg Tolstikhin, Chief Researcher and Associate Professor of MIPT’s Theoretical Physics Section. Tracking an electron isn’t like tracking any object, though. It requires a lot more imagination since, at this level, quantum mechanics is at play. In fact, it would be impossible to track an electron the way you would a bird for instance, since it can be in many places at once. 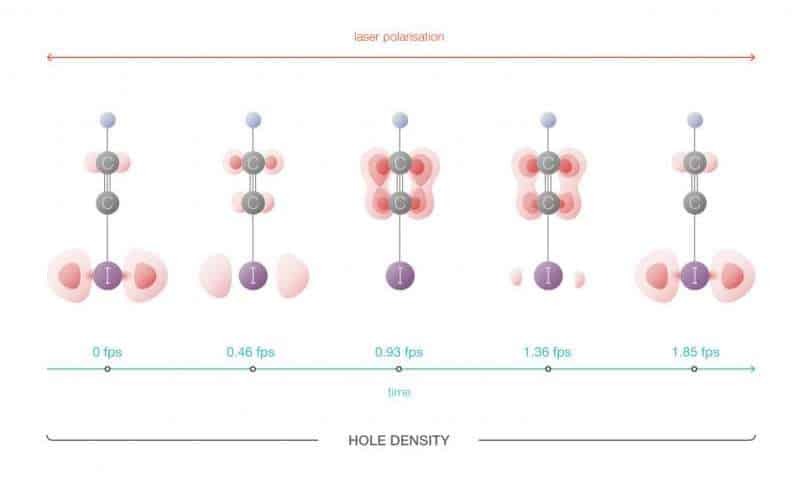 The researchers’ observations are made indirectly by studying the high-harmonic spectra reflecting the state of a molecule’s electron shell after it was zapped by the laser beam. “As a result of tunneling ionization in a strong laser field, a superposition of two quantum states of the hole occurs: it is similar to Schrödinger’s cat that is simultaneously alive and dead; in this superposition, the hole can be found at opposite ends of the molecule at the same time. The probability of finding a hole at either end oscillates over time, which is what creates the effect of the hole migrating along the molecule. The hole moves from one end to the other and the characteristic time taken for this movement is approximately 100 attoseconds,” says Tolstikhin. The paper was published in the journal Science. “In reality we are observing not the position of the electrons, but rather the high-harmonic spectrum that occurs during the process of interaction between a powerful laser pulse and a molecule. Using these spectra, which are indirectly linked to the movement of the hole, its position can be restored, which is what we have done here,” says Tolstikhin. By altering the laser polarization, the researchers say you can manipulate how an molecule’s electron shell restructures. “This is what will ultimately allow the outcome of chemical reactions to be controlled. If you have a mixture where chemical reactions can result in different outcomes, you can, by choosing the required pulse shapes, select the desired outcome,” says Tolstikhin.